It's pizza time guys! A fresh homemade pizza is always a good option than getting one from the nearest pizza outlet. The following pizza preparation includes a generous quantity of basil pesto which gives it a unique and lip-smacking flavor. Though I always advise experimenting with the pizza topping, sticking to the ingredients mentioned below is what I'll recommend for this one to get the best possible taste. I've used readymade pesto which can be substituted with fresh homemade pesto. This pizza takes lesser time to cook when compared to a regular pizza. Serve this pizza at the room temperature instead of giving it when it's hot. Let's make this scrumptious and fulfilling pesto pizza for our loved ones. 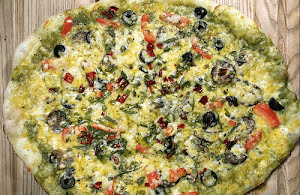 Savor this scrumptious, cheesy, and irresistible pesto pizza with a delicious topping of black olives and mushrooms to satisfy your craving taste buds. Sift together wheat flour, sugar, salt, and olive oil. Mix yeast in a quarter cup of water and add to the flour. Knead it into a smooth dough adding water in batches. Cover it with a food-grade plastic sheet and keep it in a warm corner for at least 2 hours. Preheat the oven to 250 °C. Heat olive oil in a nonstick skillet on a medium flame. Add finely chopped mushrooms and sausage to the pan. Sprinkle onion powder on top of it. Sauté for about 2 to 3 minutes and keep aside. Dust the working surface with the floor. Roll the dough base and flatten it on the surface. Make sure the base is a little bit thinner than the regular pizza base. Transfer the rolled pizza base to the lightly-greased baking tray. Evenly spread the pesto on the base. Top it with sautéed mushrooms and sausage. Sprinkle grated cheese on top of it. Finish with a generous sprinkle of sliced black olives and bell pepper juliennes. Finally, add chopped dried red chilies on top. Sausage is optional and can be omitted. Or, you can substitute it with a local chicken sausage.